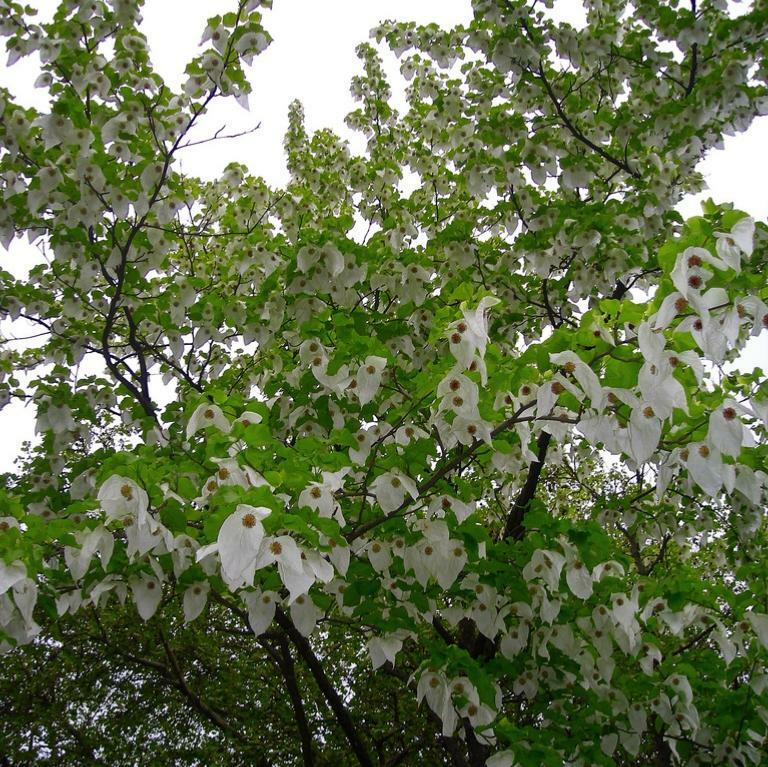 The Dove Tree (Davidia involucrata) is a medium-sized deciduous tree, usually placed in the tupelo family (Nyssaceae), but is sometimes included (with the tupelos) in the dogwood family (Cornaceae), and by yet others given family status of its own, as Davidiaceae. 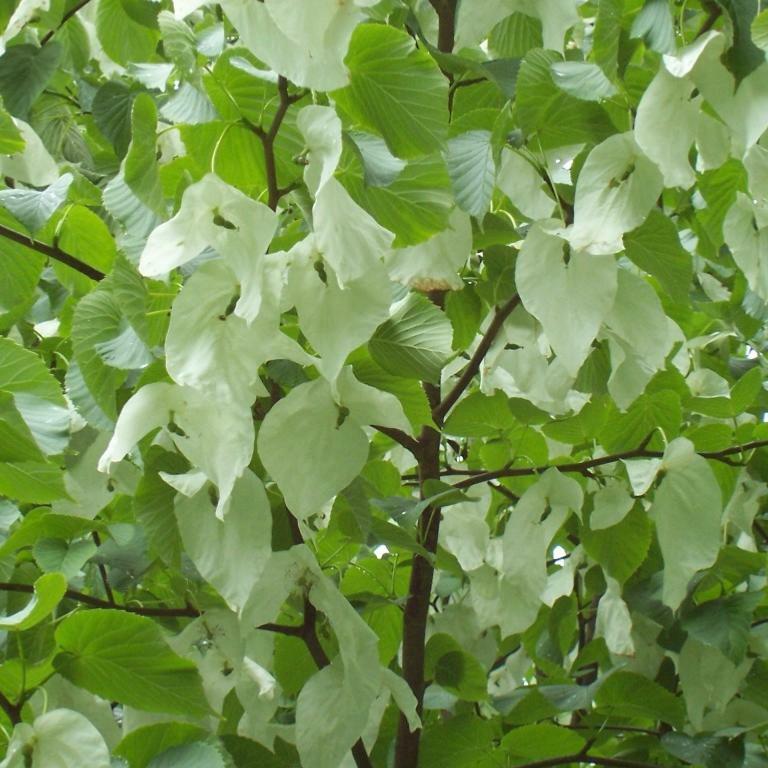 It is also known as the Handkerchief tree or Pocket-handkerchief tree. 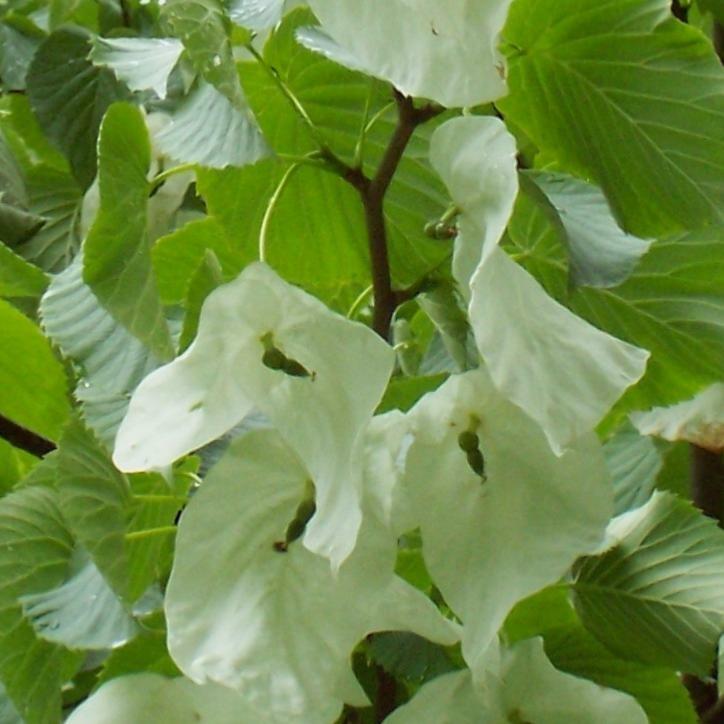 The tree is native to Central and Southwest China from Hubei to southern Gansu, south to Guizhou, Sichuan and Yunnan.The Dove Tree is the only member of its genus, but there are two varieties differing slightly in their leaves, Davidia involucrata var. involucrata, which has the leaves thinly pubescent (short-haired) on the underside, and Davidia involucrata var. vilmoriniana, with glabrous (hairless) leaves. Some botanists treat them as distinct species; with good reason as the two taxa have differing chromosome numbers so are unable to produce fertile hybrid offspring. It is a moderately fast-growing tree, growing to about 20 - 25 m in height, with alternate cordate leaves resembling those of a linden in appearance, except that they are symmetrical, and lacking the lop-sided base typical of linden leaves; the leaves are mostly 10-20 cm long and 7-15 cm wide and are ovate to heart-shaped. 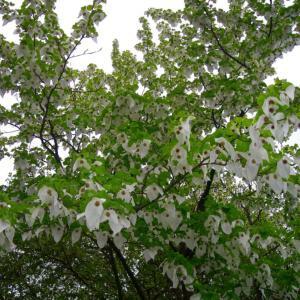 The Dove Tree or Pocket Handkerchief Tree is best known for its flowers. These form a tight cluster about 1-2 cm across, reddish in colour, each flower head with a pair of large (12-25 cm), pure white bracts at the base performing the function of petals. These hang in long rows beneath the level branches. The flowers are at their best in late May. 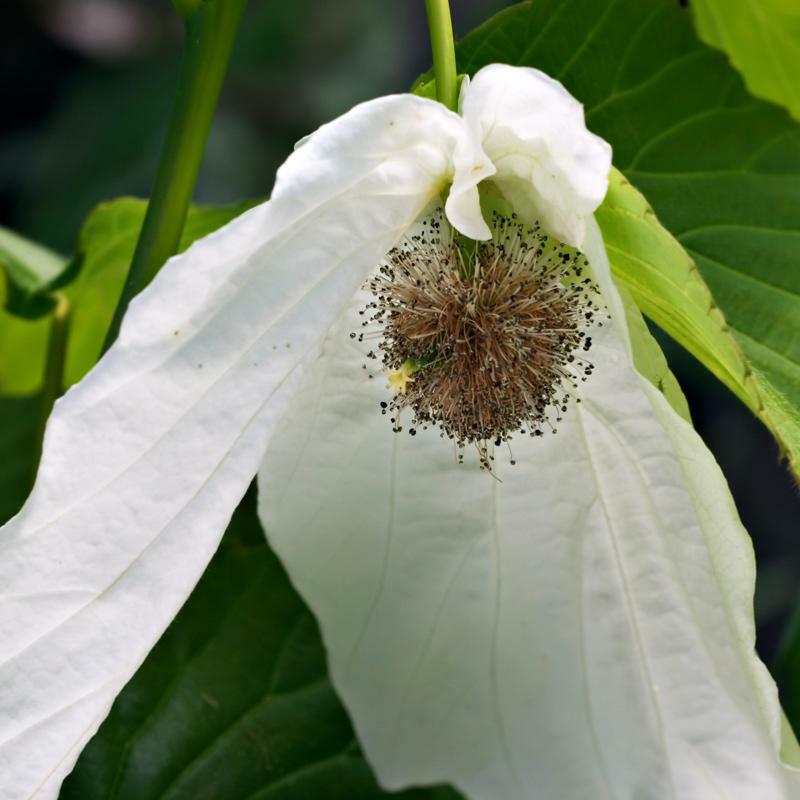 On a breezy day, the bracts flutter in the wind like white doves or pinched handkerchiefs, hence the English names for this tree. The fruit is a very hard nut about 3 cm long surrounded by a green husk about 4 cm long by 3 cm wide, pendulous on a 10 cm stalk. The nut contains 3-6 seeds. The species was introduced from China to Europe and North America in 1904, and is a popular ornamental tree in larger gardens. Most trees in cultivation are var. vilmoriniana, which has proved much better able to adapt to the climatic conditions in Europe and North America. The genus Davidia is named after Father Armand David (1826-1900), ("Père David"), a French missionary and keen naturalist who lived in China, and who is also commemorated in the Chinese White Pine Pinus armandii and Père David's Deer. He was also the first westerner to describe another rare Chinese endemic, the Giant panda (Ailuropoda melanoleuca). Although it was David who first described the tree in 1905, a single tree found at over 2,000 metres altitude, his specimens were lost in a boat wreck on the Han River rapids. Scottish plant hunter Augustine Henry again found a single tree, this time in the Yangtze Ichang gorges and sent the first specimen to Kew Gardens. Plant collector Ernest Henry Wilson was employed by Sir Harry Veitch to find Henry's tree but arrived to find that it had been felled for building purposes; however he later found a grove of the trees overhanging a sheer drop. Wilson too had his boat wrecked but managed to save his Davidia specimens. Very easy to grow in good soils in an open position.